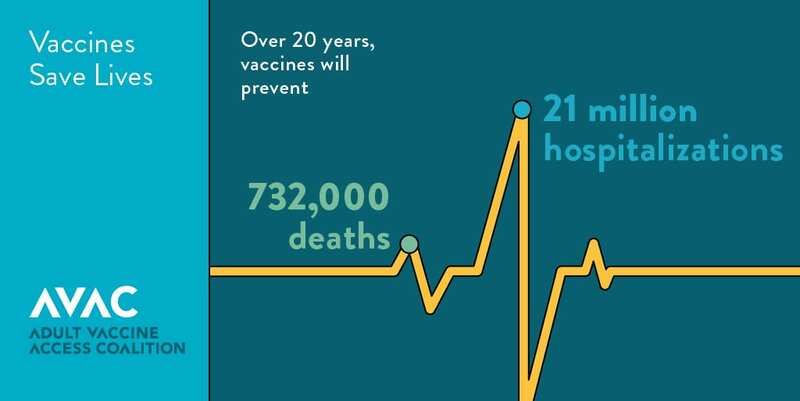 Every year, more than 50,000 adults die from vaccine preventable diseases and thousands more suffer serious health problems that could have been prevented by accessing recommended immunizations. Yet adult vaccination rates remain unacceptably low, falling short of the Healthy People 2020 recommendations. There are a variety of reasons for this, including: lack of information about recommended vaccines, financial hurdles and technological and logistical challenges. In response, a diverse group of healthcare providers, vaccine makers, pharmacies, public health organizations, patient and consumer groups launched AVAC to make necessary policy changes to increase vaccination rates – to save lives and money. Vaccines protect us from a variety of common diseases that can be serious and even deadly. National immunization campaigns have resulted in the elimination and virtual eradication of once devastating conditions, such as polio, rubella, diphtheria, and measles. Federal, state, and local governments, public and private healthcare providers, and patient and consumer groups have collaborated extensively to create a seamless immunization delivery system for children. Immunization rates for children are high due to: clear and predictable vaccine schedules; near universal immunization coverage through federal programs such as the Vaccines for Children Program and the Centers for Disease Control and Prevention (CDC) Section 317 program; and, coverage for preventive health services through private insurance. Despite the tremendous accomplishments for children, adults still face many challenges when seeking to take advantage of the protection from vaccines. Each year, upwards of 50,000 adults die from vaccine preventable diseases, such as influenza and pneumonia, and many thousands more suffer serious health problems. While increased attention has been brought to the need for the annual flu shot, widespread uptake of the influenza and the pneumococcal vaccine among the adult population could be greatly improved. According to the CDC, only 38 percent of adults (age 18 and older) received a flu shot in 2010-11 while the Healthy People 2020 objective is 70 percent. Similarly, 62 percent of adults over 65 and only 20 percent of high risk adults between 19 and 64 have received a pneumococcal vaccine while Healthy People 2020 vaccine rate objectives are 90 and 60 percent, respectively. Vaccination rates for other preventable conditions, including tetanus, diphtheria, pertussis, and zoster (shingles), among others, also remain well below target levels. Adults seeking access to and coverage for vaccines encounter a confusing health care system that presents multiple barriers, including lack of information about recommended vaccines, financial hurdles, as well as technological and logistical obstacles. For example, state Medicaid plans offer some coverage for adult vaccines, though many do not offer access to all ACIP-recommended vaccines. Medicare coverage for ACIP-recommended immunizations is complicated and fragmented in terms of which providers offer vaccines and how much elderly and disabled beneficiaries may be required to pay to receive them. Privately insured patients are required to have access to recommended preventive screenings and vaccines at no cost, however, they may encounter cost and access barriers to immunization services from their community provider (such as a pharmacist or an employer-based health clinic) or may face additional costs if the service is not part of a preventive health visit with their primary care provider. AVAC’s goal is to make necessary policy changes to increase vaccination rates – to save lives and money.